Losing weight has always been difficult. With people starving themselves to following fad diets, almost half the world has tried everything but without any success. Using supposedly magic ingredients to supplements and diet pills has simply proved how desperate everyone is to shed those extra pounds and look fabulous. However, it is not as easy as it sounds especially when a simple cup of coffee costs you 450 calories. But there are simple weight loss secrets that you can employ and follow to shed your weight. 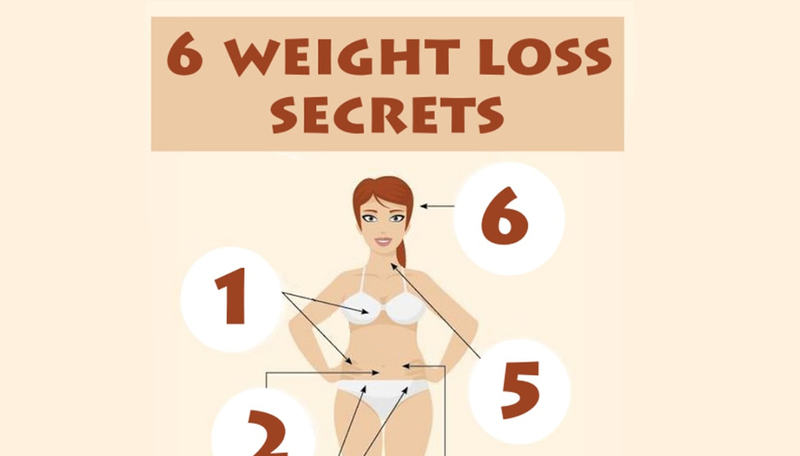 These weight loss secrets do not require much hassle and are pretty simple to follow and keep in mind. It is developed through a lifetime of experience, research data and thorough observation. These are some things we often ignore and do not pay much attention to because they do not seem so trivial to us. But they are really effective and almost act like a catalyst for weight loss that we choose to ignore. One of the effective ways to lose weight is through drinking water (see this diet based on drinking more water). Many researchers have substantiated this with facts. However, drinking water is something we always ignore. We drink it only when we are thirsty and have the bare minimum. That won’t merely make you lose weight. You need to have at least 8 glasses of water every day in order to curb the hunger and also flush out the toxins effectively. It is also really important that you keep a record of how much you drink in a day, as you might overestimate if asked to guess. One of the weight loss secrets, which, in fact, is not a secret, but we all avoid it, is to not starve yourself. Many people have this notion that the only way to lose weight is by starving as they think that the hunger pangs will evaporate with time. But that is not fact you want to test. It has been proved and observed by many that starving actually stands in the way of losing weight. When you are hungry, your body gets stress and starts storing fat. The metabolism slows down, which thus prevent you from shedding those pounds. The only way to lose weight is following a strict diet plan without skipping any meals or starving yourself. Keep a food journal to track the amount of calories you consume and stop cheating yourself. Many people when trying to lose weight, go out to eat at healthy restaurants. No matter what you have and where you have, restaurants are a complete no-no if you really want to lose weight. They always use certain spices and preservatives that add to your daily calorie intake. Moreover, the portions they offer are much larger and again hinder your weight loss. Thus, eating at home and eating healthy is one of the weight loss secrets that many are unaware of. You can simply mix and match like some veggies with some whole grain or protein will work wonders for your weight. Remember, eggs are one such versatile protein that you can add to any meal and expect to lose weight. Oftentimes, people who are on a diet plan want a cheat day and want to consume things they haven’t had for a long time. However, they tend to overdo it by eating everything at once. They start right with a carbohydrate rich meal like pasta, drink it with alcohol, have fatty proteins like steak and gorge on dessert later. This is not only bad for you but it just hinders your weight loss programmes as it undoes everything you achieved for so long. One of the most efficient weight loss secrets is to choose and select your vices wisely on which you can indulge on your cheat day. You can just drink a bit more of that wine you have opened or just gorge on that fabulous cake you got from the bakery. But do not overindulge! You always need to keep healthy snacks at hand in order to avoid going back to junk food. You need to find alternatives for snacks like look for healthy frozen foods that you can heat up easily. You need to learn new ways to make on the go nutritious snacks that you can make easily. They need not be fresh but it should be nutritive and organic. You can try out organic veggies burgers, frozen veggies or fruits as well. If you want to munch on something crunchy, go for organic gluten free black bean chips. One of the most important weight loss secrets is to stay motivated. It is really hard to stay so especially with so many food options around you. You need to accept that plateaus are normal, that there will be times when you won’t be losing weight consistently, but gradually with time. You need to stick with the plan and just wait for your body to respond.